I was rather surprised by this book, but I shouldn't have been. It does exactly what it says on the tin. 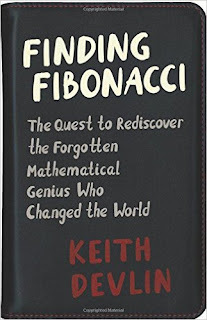 The subtitle is 'The quest to rediscover the forgotten mathematical genius who changed the world.' 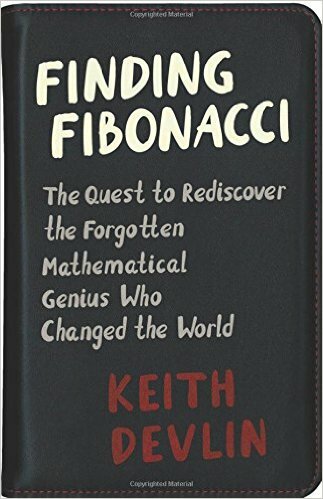 So I shouldn't really complain that the book is far more about the quest than about the mathematician Fibonacci and his work - but I was disappointed nonetheless. What I would learn from that visit was that the story of the Liber abbaci [Fibonacci's oddly titled book introducing the numbers] is a very human one, spanning many centuries, with an ending (assuming the translation into English is its ending) every bit as dramatic as any Hollywood scriptwriter could dream up. It really isn't. It's engaging without doubt, but not exactly worthy of the dramatic lead up. It didn't help that the book opens with an introduction that sounds like it was written by Troy McClure from the Simpsons (the actor character who introduces himself along the lines of 'You may remember me from such educational films as...') - Devlin spends quite a while telling us he is quite famous as 'the math guy'. Okay. At its core, there's some good material here about the introduction of our current numerals from India via the Arabic world through the influence of Fibonacci's book, which resulted in a whole chain of 'how to' smaller books for practical use. I don't doubt Devlin's assertion that the introduction of these numbers was crucial to finance, trade and science, though I think he over-inflates the importance of Fibonacci as an individual. The number system would have arrived anyway - and though he certainly had a strong influence on its use, it's interesting that in some countries there was strong resistance, with records having to use numbers written out as words for several centuries. In a way, the problem with this book is it's a bit like one of those 'Making of' TV shows you get when a blockbuster film comes out. There are a lot of tantalising mentions of things in Devlin's 'real' book on Fibonacci, where this title focusses very much on his adventures visiting libraries in Italy. There's also a lot of repetition - sometimes almost word for word between chapters - all in all, it would have made a really good magazine article, but I'm not sure it's a book I'd recommend unless you are particularly interested in the details of doing this kind of research. ADDED: Thanks to Davide Castelvecchi from Nature for pointing out some oddities in the 'facts' presented in this book. You can see his review here.